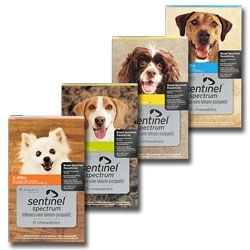 Sentinel Spectrum contains Milbemycin Oxime, Praziquantel (offering treatment and control of tapeworms), and Lufenuron (stopping fleas before they become adults, thereby breaking the flea lifecycle). Pillow-shaped chewables facilitate dosing. Each chewable is cured, cut and packaged in a protective blister pack to preserve freshness. For dogs and puppies six weeks of age and older.